While there is no argument about how deadly distracted driving is, a recent study by Zendrive is alarming. Zendrive’s study tracks cell phone use for automobile insurers and ride-sharing services. 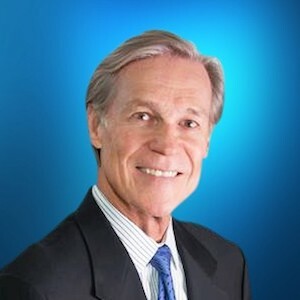 The study monitored 2.3 million drivers who travelled more than 5.6 billion miles. It found 12 percent of those drivers were considered mobile-phone addicts who call, text or scroll through apps three times more than the average driver. Recent fatality statistics prove the study’s relevance. U.S. road deaths surged by 14.4 percent between 2014 and 2016. The largest fatality spikes were among pedestrians, cyclists and motorcyclists because when someone is glancing at a text message those victims are not seen until it’s too late. In 2017 the fatality rate is 6% higher than in 2015. If the estimate holds, it will be the second consecutive year that motor vehicle deaths topped 40,000 . To date, the Terrell Hogan Distracted Driving Awareness Campaign has reached more than 8,847 teens and adults on the First Coast through its presentations. Contact our office for a complimentary Distracted Driving safety presentation for your club, organization or at your job. We can all be a part of the solution to end the danger of distracted driving. The Terrell Hogan Distracted Driving Awareness Campaign was inspired by the Casey Feldman Foundation and EndDD.org, in memory of Casey Feldman, a 21 year-old pedestrian who was killed in a crosswalk by a distracted driver. 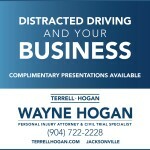 To schedule a free presentation call Terrell Hogan at (904) 722‑2228 or visit terrellhogan.com.